The SAS interface is primarily used to move data over short distances to and from HDDs, SSDs and adapter cards in servers and storage systems. The SAS protocol is less commonly used for storage networking purposes. The SAS protocol was designed to replace parallel SCSI, which had expansion limitations and lower traffic speeds. The SAS protocol enables data to be transferred serially, or one bit at a time, allows multipath I/O and provides faster throughput than parallel SCSI. As a drive interconnect technology, the SAS interface overtook FC, which declined in use as SAS drives became faster and offered cost advantages. Because SAS is a superset of Serial ATA, users can mix SAS and SATA drives in their environments without the need to invest in protocol conversion technologies. The first interoperability "plugfest" to test 3 Gbps SAS took place in 2004, and products began rolling out the following year. Testing of 6 Gbps SAS started in 2008, and the first products emerged in 2009. The next speed bump to 12 Gbps SAS technology -- which actually has a maximum bandwidth of 9.6 Gbps -- fell in line with the industry's move to high-speed SSDs. Tests of 12 Gbps SAS began in 2012, and volume product shipments started in 2015. The SCSI Trade Association is targeting 2018 for the first plugfest of next-generation 24 Gbps SAS, which actually provides a maximum data transfer rate of 19.2 Gbps. Shipments of 24 Gbps SAS products are expected to commence in 2018, with volume availability to follow in 2019. 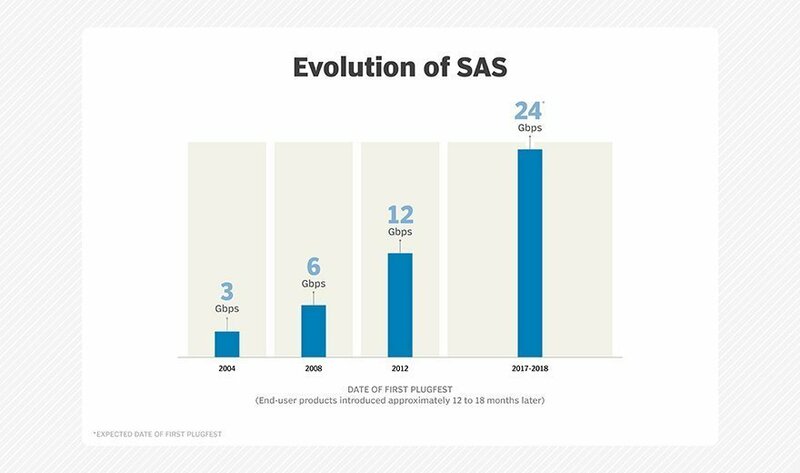 As with prior SAS releases, 24 Gbps SAS technology will be backward compatible with the two prior SAS generations (6 Gbps and 12 Gbps), as well as with 6 Gbps SATA. SAS has faced pressure in the high-performance segment with the emergence of SSDs that support NVMe over the PCIe interface, which typically use four lanes of bandwidth to provide faster performance. Increasing numbers of PCIe SSDs use latency-lowering NVMe, which streamlines the register interface and command set. SAS-based SSDs use the small computer system interface command set to transfer data, typically over a single lane. Industry momentum appears to be strong for NVMe-based PCIe SSDs. However, the SCSI Trade Association says the SAS protocol offers some advantages, including faster per-lane performance of 12 Gbps SAS over PCIe 3.0, inherently greater scalability than NVMe, hot-pluggable drives and time-tested failover capabilities. The SCSI Trade Association developed SCSI Express to allow the SCSI protocol to be carried over four lanes of PCIe. However, no products supporting SCSI Express were ever released. What's the outlook for SAS SSDs versus NVMe-based PCIe SSDs over the next few years?